Thanks to Phil George W7GTI (automator on EFnet) for taking the club station on the road! Check him out on the HHH Net and the 3905 Century Club nets. Please QSL direct to W7GTI. 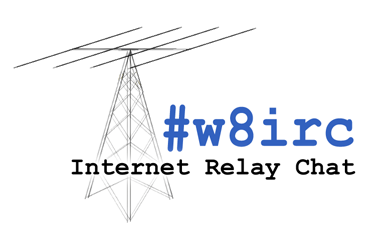 EFnet's #HamRadio has been the official channel of W8IRC since the club's inception in 2002, but membership and representation automatically includes any willing ham radio operator who uses IRC anywhere. So drop us a line! What's your call, and what IRC networks and channels do you frequent? And let us know of any updates to the list of known channels below. The club's W8IRC / QRZ bot is available in some of the channels listed below. Click here for a quick reference of bot commands. Please like the channel's Facebook page for more information. There are usually close to 500 clients in this channel at any given time with round-the-clock activity. Remember to use the double hash on the channel name when joining (/join ##hamradio). This channel includes the W8IRC bot for detailed QRZ callsign lookups, DXCC data, APRS lookups, DMR lookups, DX Summit spots, Q-signals, solar data, morse code translations, weather conditions, rigpix.com lookups, and a lot more. #brandmeister Discussion about the BrandMeister DMR network, and all things Digital Voice. Pi-Star is also a common topic of conversation here. And as various digital modes are being bridged together, D-STAR, Fusion, P25, and NXDN are also frequently discussed. #swvadmrnet This channel is in support of the SWVA DMR Net. The Net meets each Wednesday evening at 8:00 pm Eastern (0000 UTC) on the Virginia Statewide Talk Group 3151. #md380 Firmware and general info about the TYT MD-380 radio. #w8irc For activity and testing surrounding the W8IRC bot. Might not be much to see here, but all are welcome to join. Bots provide real-time DX Summit Spots, WWV numbers, solar forecasts, and much more. United Veterans of Maine ARC - K1UVM. #radio All things radio including DXing and even some electronics too....all are welcome! General weather inquiries. For real-time weather alerts, please join ##wx-alerts. Team of people packaging and documenting amateur radio related software in Debian. The channel for /r/amateurradio on Redit. Automated ham radio related for-sale listings from various sources around the Internet. Active since 1991. Officially still the home of the W8IRC radio club since 2002, although most activity is now at freenode (see above). Read a little about the channel's early history. ExodusIRC #hamradio Includes a bot for callsign lookups.